Close to the village amenities of Temple Cloud. STUNNING PERIOD HOME. Detached Grade II listed Old Court House in the heart of a popular village with VERSATILE ACCOMMODATION, which is full of HISTORY and CHARACTER. Accommodation includes FIVE RECEPTIONS, EIGHT BEDROOMS, private courtyard and POTENTIAL FOR DUAL OCCUPATION. EPC rating exempt. DESCRIPTION WE ARE LOOKING FOR THE NEXT CUSTODIAN FOR THIS FINE RESIDENCE STEEPED IN LOCAL HISTORY. Sure to suit buyers who have an appreciation for traditional and period homes, this Grade II listed detached old court and police station is a fine example. Dating from 1857, it truly is overflowing with stories and tales to pass to the next owner. Having lived in the property for almost 20 years, the current owners have moulded The Old Court to suit the needs of a growing family whilst simultaneously accommodating paying guests. Viewers of Channel Four may have seen this property on 'Four in a Bed' which showcased its wonderful individuality. The scene is set when you go through the original front entrance into an impressive reception hall with a stair case leading into a antechamber to the centre piece of the property ... the original magistrates court room with vaulted ceilings and stone mouldings. A feature stone fireplace is also a focal point of this room. There are four further reception rooms which are located throughout the property giving the new owners the opportunity to create their own lifestyle. The kitchen/breakfast room has an Aga and a view over the courtyard to rear of the property. Arranged over three floors of the property we have eight bedroom suites including the Magistrates Chambers and the Judges suite. The property has yet another angle which we believe has yet to be explored. Main house - Four reception rooms, kitchen/breakfast room, five bedroom suites. Two loft rooms. 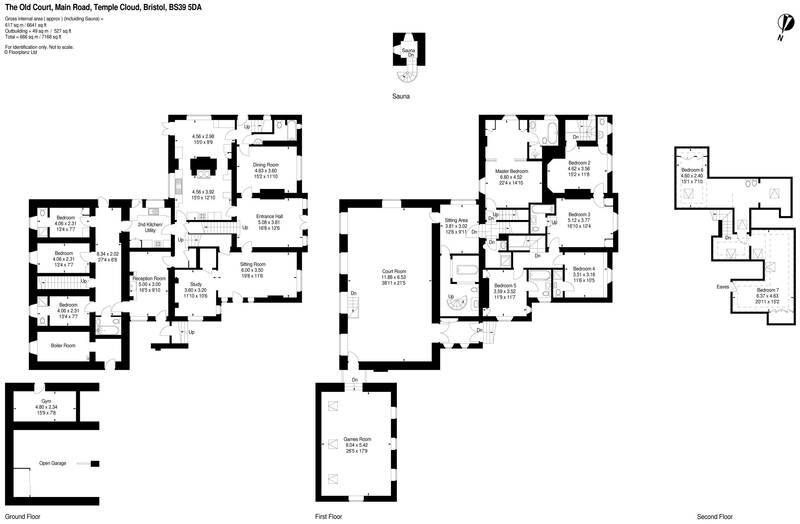 Secondary accommodation - separate entrance, reception room, kitchen, bathroom and three bedroom suites. Outside we have parking for numerous vehicles plus undercover parking. We have a boiler room and a gymnasium. Featured gardens surrounding the property with a beautiful carp fishpond in the courtyard. SITUATION Temple Cloud offers good access to Bristol, Bath and Wells. Within the village there is a primary school, petrol station, public house, general store and doctors surgery whilst the neighbouring towns and cities of Midsomer Norton and Wells provide a wider range of local facilities. Mainline rail services are available from Bristol and Bath whilst Bristol International Airport is a short drive away. The surrounding area has a number of facilities including several farm shops, golfing at Farrington Gurney, sailing at the Chew Valley lakes and tennis at Pensford and the schooling in the area is excellent.